This is the hole of the seven springs! 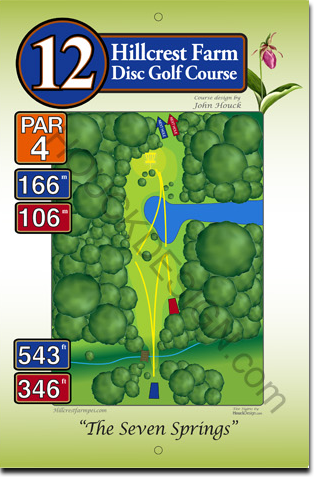 A par 4, 166 metre hole, you’ll start off with a toss over the brook to the large, wide fairway. But don’t be fooled — although you can’t see it because of the uphill grade, Pilkey’s Pond is on the right. The basket is on the left, bordered by tiny freshwater springs in a half-moon. Not a problem when it’s dry, they disappear!